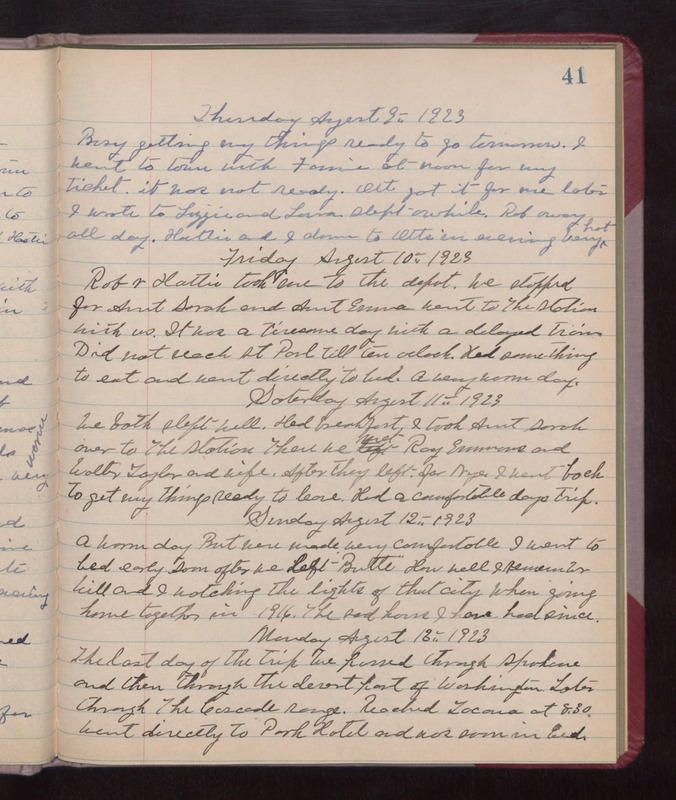 Thursday August 9th 1923 Busy getting my things ready to go tomorrow. I went to town with Fannie at noon for my ticket. It was not ready. Otts got it for me later. I wrote to Lizzie and Laura. Slept awhile. Rob away all day. Hattie and I down to Otts in evening. very hot. Friday August 10th 1923 Rob & Hattie took me to the depot. We stopped for Aunt Sarah and Aunt Emma went to The Station with us. It was a tiresome day with a delayed train. Did not reach St Paul till ten oclock, Had something to eat and went directly to bed. A very warm day. Saturday August 11, 1923 We both slept well. Had breakfast. I took Aunt Sarah over to The Station. There we met Roy Emmons and Walter Taylor and wife. After they left for [Wye?]. I went back to get my things ready to leave. Had a comfortable days trip. Sunday August 12th 1923 A warm day, but were made very comfortable. I went to bed early. Soon after we left "Butte." How well I remember Will and I watching the lights of that city when going home together in 1916. The sad hours I have had since. Monday August 13th 1923 The last day of the trip we passed through Spokane and then through the desert part of Washington. Later through The Cascade range. Reached Tacoma at 8.30. Went directly to Park Hotel and was soon in bed.